The weekend of the Decatur Wine Festival, Katruska, The Piper, and I decided to stop by Leon’s Full Service before catching a show. I arrived before my cohorts and wound my way carefully through the standing room only crowd to the bar where I was lucky enough to grab a couple of seats. At this point, I began to wonder if the food and drink would be worth the noise and press of the crowd. Indeed they were…and then some. After surveying the cocktail menu by the renowned Atlanta mixologist, Miles Macquarrie, I decided on a “Whitehall Mystery” (Hayman’s Old Tom gin, Plymouth sloe gin, Pommeau de Normandie, Cocchi Americano, acid phosphate). I must admit I ordered this cocktail based on the fact that I once tried sloe gin and couldn’t get a glass of water fast enough. This may seem odd, but I’ve always enjoyed watching a master take something under appreciated and attempt to make it into a spectacular creation. Mr. Macquarrie did not disappoint. The beverage was a treat for the senses with a sensuous red color, delicate fruit fragrance, and glorious mix of flavors. The flavors were a combination of apple from the Pommeau de Normandie, orange rind, vanilla, and herbs from the Cocchi Americano, and a of bit berries and extra herbaceous levels from the gin combination. While Katruska found this one a bit too sweet for her taste, I enjoyed it tremendously. The evening was off to a great start and I couldn’t wait to explore the rest of the menu. 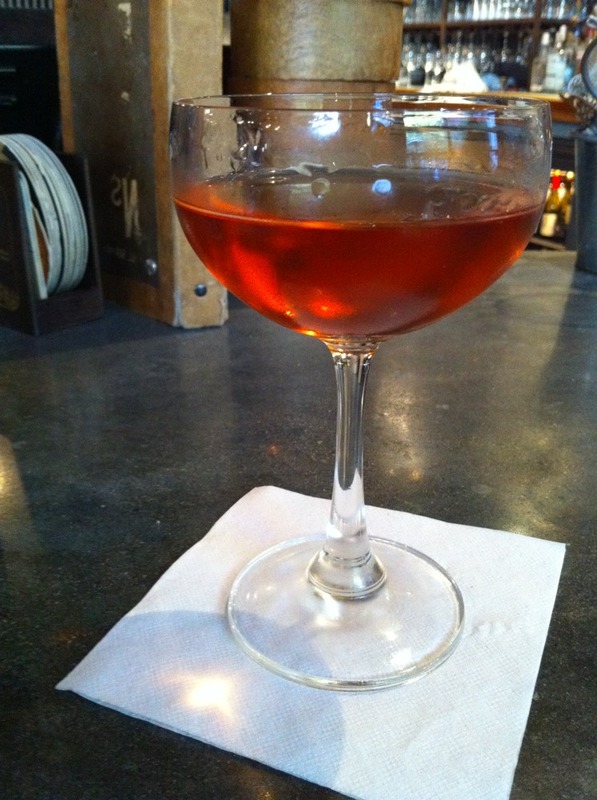 My second selection was a “The Mustache, Refined” (Prunier V.S. 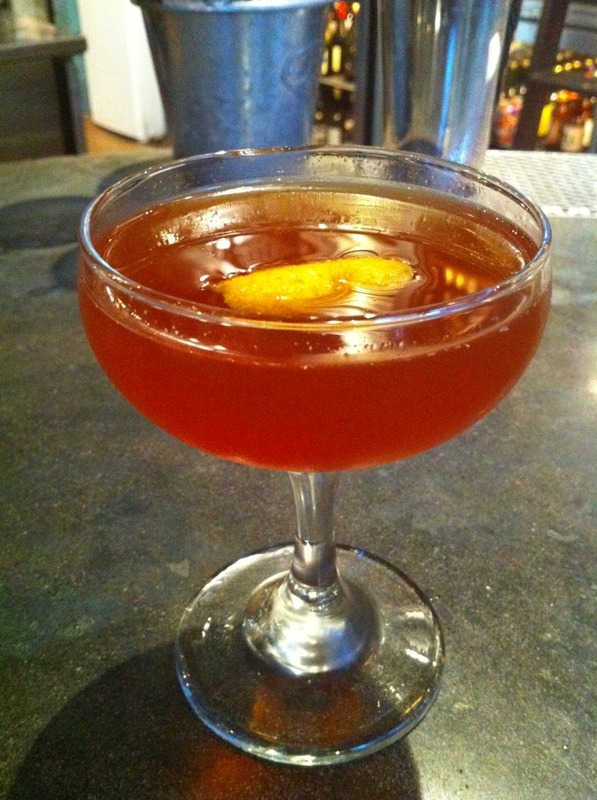 cognac, house Picon, Dolin dry vermouth, pear syrup, Peychaud’s bitters, tincture of cinnamon). While similar in appearance to the “Whitehall Mystery”, this drink had a completely different flavor profile. It had hints of almond, orange rind, pears, with a definite cinnamon finish. “The Mustache, Refined” reminded me of fruit compote that I had a Thanksgiving several years ago without being overly sweet. As are usual of my choices, these may not be for everyone, but I highly suggest you give one or both a try. I can’t wait to return and try more of Leon’s Full Service’s options! 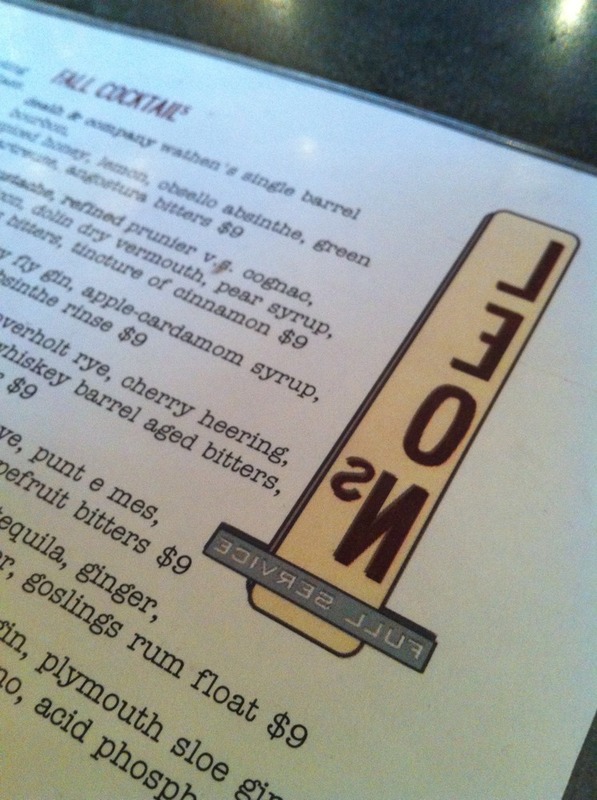 In the meantime, checkout Katruska’s article The Bourbon Tour for information on the drinks she tried at Leon’s.